Yorkshire Pudding is an English dish traditionally made from a batter consisting of eggs, flour, and milk and then baked in hot pan drippings. It’s not a pudding in the American sense of the word but rather a cross between a popover and a soufflé. The dish is usually served with roast meat and gravy and is a staple of British cuisine. Creating a vegan version without eggs poses a fundamental problem, since the eggs are necessary to inflate the batter as the pudding cooks. However, with a few adjustments and substitutions a very satisfying, albeit less inflated version can be made. Be sure to read though the directions first and then follow them carefully for success. 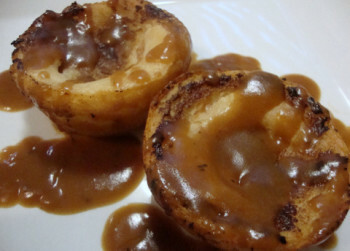 Serve the “Yorkies” with sliced roast seitan and plenty of savory gravy. Sift together the flour and salt into a mixing bowl. In a small dish, mix together the melted butter or margarine with the Worcestershire sauce and 1 tablespoon olive oil. Spoon a little over one teaspoon into the bottoms of a 6-cup muffin tin (in other words, divide evenly). In a small bowl, whisk together the very warm water, egg replacer powder and baking powder until frothy. Place the muffin tin in the oven and set a timer for 3 minutes to heat the “pan drippings”. Meanwhile, add the soymilk, egg replacer mixture and the remaining tablespoon of olive oil to the flour and whisk vigorously until a smooth batter is achieved. After 3 minutes, remove the muffin tin from the oven and immediately pour the batter, dividing evenly in each cup (about ⅓ of the way full). Place in the oven on a middle rack and set a timer for 35 minutes. Keep in mind that the puddings will have inflated only slightly and not in a dramatic fashion as their traditional egg-laden counterparts. Remove the muffin tin from the oven and let cool for about 5 minutes. Serve hot. 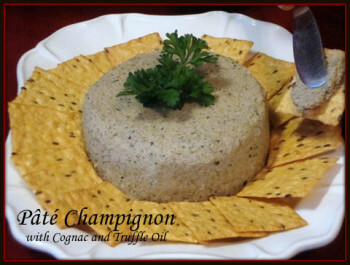 An elegant, earthy and rich mushroom pâté flavored with cognac and truffle oil. This pâté has a strong mushroom flavor; for a milder pâté, reduce or omit the truffle oil. Press the tofu until it is not releasing any more liquid. It is important to press the tofu as dry as possible. Line a 2-cup minimum plastic, metal or ceramic container with plastic wrap. The container will serve as the mold to shape the pâté. Crumble the tofu into a food processor. Add the truffle oil and salt and set aside. In a skillet over medium heat, melt the butter or margarine. Add the shallots/onions and mushrooms and sauté until the vegetables are nicely browned. Add the cognac, parsley, garlic, thyme and optional mushroom powder and sauté until the liquid has completely evaporated. Transfer the contents of the skillet to the food processor. Remove the lid from the jar of coconut oil and place the jar in a microwave. Heat until the solid oil liquefies, about 30 seconds to 1 minute (this will depend upon the solidity of the coconut oil). Alternately, you can place the jar in about an inch of simmering water and melt the oil in the same manner. Measure 2 tablespoons and add to the food processor. The coconut oil is used to firm the pâté when chilled. Process the mixture until smooth. Add the pepper and pulse a few times to combine. Taste and add additional salt or pepper as desired. Transfer the mixture to the container, smooth the surface, cover with additional plastic wrap and refrigerate for several hours until firm. When firm, lift the pâté from the container and invert onto a serving plate. Peel away the plastic wrap. Spread on hors-d’oeuvre toast or savory crackers. A favorite Autumn and Winter treat and perfect for celebrating the holidays. 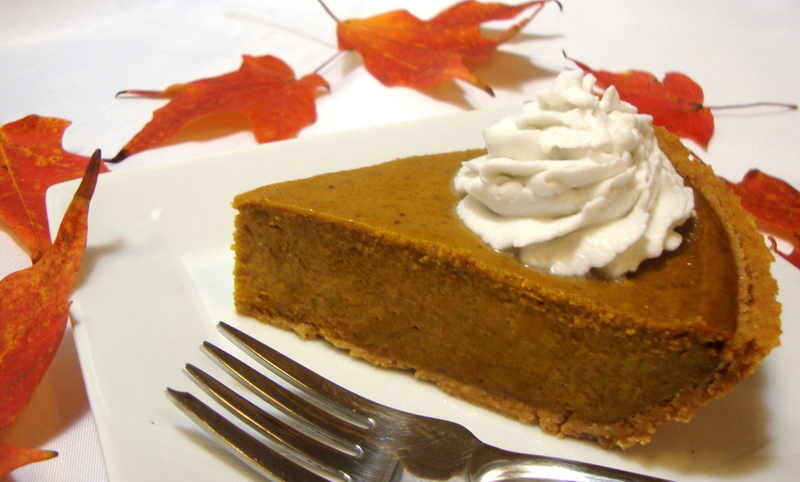 Vegan pumpkin pies are often made with tofu as a replacement for the evaporated milk and eggs. Although I use tofu frequently and successfully in eggless egg recipes and desserts, I find its undertaste to be rather noticeable and distracting in pumpkin pie. Therefore my goal was to create a pumpkin pie using a creamy cashew base which allows the flavor of the pumpkin and the warm spices to predominate. 1 can pumpkin purée 15 oz. Soak the cashews in water in the refrigerator for about 8 hours to soften and hydrate. To expedite the soaking process, pour boiling water over the cashews and let soak for 1 hour. Drain the cashews and add them to a high-powered blender. Add the non-dairy milk and process for 2 full minutes. Add the remaining ingredients and process until completely smooth. The mixture will be quite thick, so occasionally stop to scrape down the sides of the blender with a spatula and stir the contents back down into the blades as necessary. Use a tamper tool if provided with your blender. Spoon the mixture into the pie shell and smooth the surface with a spatula or large spoon. Don’t worry about a few swirl marks as they will minimize when the pie cools. Place the pie on the middle rack of the oven and bake for 15 minutes. Reduce the heat to 350°F and continue to bake for an additional 50 to 55 minutes or until a toothpick inserted in the center of the pie comes out clean (do not exceed 60 minutes). Note: The surface of the pie will appear dry after baking; this will resolve once cooled and chilled. Remove the pie and cool completely on a wire rack (until the underside of the pie plate no longer feels warm). Loosely cover with plastic wrap and refrigerate until completely chilled and firm before slicing and serving. Try to avoid laying the plastic wrap in direct contact with the surface of the pie as moisture condensation will result. The pie can also be chilled in a large, sealable storage container. Top individual slices with a dollop of non-dairy whipped cream, if desired. A rich and creamy non-dairy and egg-free concoction flavored with vanilla and nutmeg. Spike with your favorite liquor, if desired, such as brandy or rum and garnish with a dash of freshly grated nutmeg. Eggless eggnog is also fantastic when added to hot coffee! Pre-soaking the cashews is not required. This recipe yields about 4 cups or 1 quart. Notes: If the mixture is too thick for your liking, small amounts of additional non-dairy milk can be added to adjust the consistency. 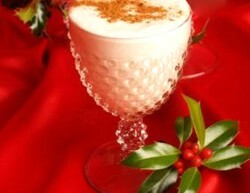 Keep in mind that if liquor will be added to the eggnog, this will also dilute the consistency. Place the cashews and the non-dairy milk in a high-powered blender with the remaining ingredients (except for the optional liquor) and process the mixture for 2 full minutes on high speed. Pour the eggnog through a fine mesh strainer into a sealable container and chill thoroughly. Discard any undissolved solids captured in the strainer. Stir or shake the eggnog before serving and stir in the optional liquor. Pour into individual glasses and garnish with grated nutmeg. Store refrigerated and consume within 7 days. This is a traditional sage bread dressing or stuffing enhanced with sautéed mushrooms and crunchy water chestnuts. Begin this recipe a day ahead of time to allow the bread to sufficiently dry. To dry the bread: Preheat the oven to 200°F. Cut the bread into ½-inch cubes and place in a single layer on 1 or 2 baking sheets. Place in the oven for 1 to 1 and ½ hours or until the bread is dry to the touch – a very slight degree of moistness is okay. Transfer to a large mixing bowl and let sit out overnight. When ready to prepare the dressing, preheat the oven to 375°F. Grease a large, shallow baking dish with butter or margarine and set aside. In a large skillet, add the oil and place over medium heat. Add the onions and celery and sauté until the onions are translucent. Add the water chestnuts, garlic, sage, thyme, salt and pepper and continue to sauté an additional minute. Transfer to the mixing bowl. In the same skillet, melt 2 tablespoons of the butter or margarine over medium heat. Add the mushrooms and sauté until golden brown. Add the remaining 2 tablespoons butter or margarine and stir just until melted. Transfer to the mixing bowl, add the parsley and toss all of the ingredients together thoroughly. Drizzle in half of the broth and toss thoroughly. Drizzle in the remaining half and toss until the dressing is evenly moistened. Transfer to the baking dish and bake uncovered for 45 minutes or until a nice golden crust forms on top. Serve warm. If using fresh green beans, steam or boil the beans for about 20 minutes or until tender. Drain thoroughly and set aside in a large mixing bowl. If using canned green beans, drain them thoroughly and set aside in the mixing bowl. Preheat the oven to 350°F. Lightly “butter” a casserole dish with the butter or margarine and set aside. In a small dish, measure the flour, onion powder and garlic powder; set aside. In a measuring cup, measure the non-dairy milk and add the tamari/soy sauce and Worcestershire sauce; set aside. In a small saucepan over medium heat, melt 1 tablespoon of the butter or margarine. Add the mushrooms and sauté until the excess liquid has evaporated from the mushrooms. Transfer the mushrooms to the mixing bowl with the green beans and set aside. In the same saucepan, melt the remaining 2 tablespoons of butter or margarine over medium-low heat and whisk in the flour mixture. Continue to stir for about a minute. The mixture will be very thick and pasty. Don’t be concerned if the flour sticks to the bottom of the saucepan as it will loosen when the milk mixture is added. Slowly whisk in the milk mixture until smooth, add a pinch or two of black pepper and bring to the mixture to a boil, stirring constantly. Reduce heat and simmer an additional 2 to 3 minutes. The mixture will have a somewhat thin consistency; this is desirable as it will thicken when the casserole is baked. Taste and add salt to your liking and additional black pepper, if desired. Remove from the heat. 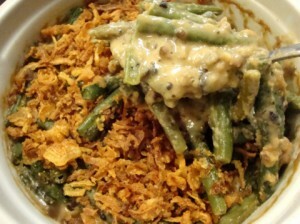 Gently toss together the cream mixture with the green beans, mushrooms and ⅔ cup French-fried onions in the mixing bowl. Transfer to the casserole dish. Bake uncovered for 25 minutes or until the bean mixture is hot and bubbling around the edges. Gently stir and top with the remaining ⅔ cup onions. Bake for an additional 5 minutes or until the onions are golden brown. Mix the flour, salt, and ground peppers in a large bowl. Slice the onions and separate into rings. Soak the onions in the milk. Heat about ½-inch of oil in a large skillet over medium-high heat until it begins to shimmer. Dredge the onions in the seasoned flour. Give them a good coating of flour. Place the onions into the hot oil in the skillet. Don’t try to do all the onions at one; just one batch at a time. When the onions begin to brown around the edges, turn them over and cook an additional minute or so (they cook very quickly!) Remove the rings and lay them on a paper bag or paper towels to cool/drain. Serve immediately or store in an air-tight container for topping your casseroles.